FEATURED PHOTO: Venom Dancers Inc. won fourth place at the 1998 National Black College Cheerleading and Dance Team Competition. Click on the image to enlarge it. Venom Dancers Inc. has performed at two football pep rallies this season. The first pep rally in which Venom performed was for the first home game of the season. A large crowd of Rattlers gathered around a stage set up on FAMU's intramural feild and watched several groups perform. Venom's second pep rally appearance was in the FAMU Student Union courtyard. This is the first year Venom Dancers Inc. has made regular appearances at football home games. As the the band played in the stands, we performed a large variety of sideline routines. It may have been quite exhausting, but it was also lots of fun! Venom Dancers Inc. danced each week at a pre-football show hosted by Coach Billy Joe. Venom pumped up the FAMU spirit by performing short side line routines. 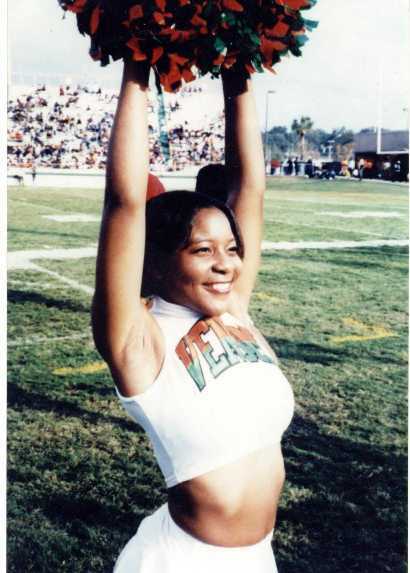 The 1998 National Black College Cheer and Dance Team Competition: We were awarded the fourth place trophy at this dance competition in Atlanta, GA.
"Be Out Day" is FAMU's annual university picnic. One of the highlights of this event was an on-stage perfomance by Venom Dancers Inc. The Strikers, an all male FAMU dance team, hosts an annual talent show...the Gong Show. As the entertainment for this event, we performed a high-energy dance routine.